When I first glanced at this one I didn’t realize it was Black Swan. 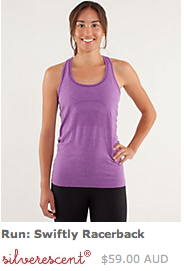 I don’t love the tank in this color but the color combo intrigues me. 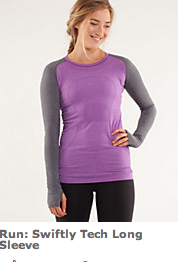 Do the contrasted Black/Color No Limit Tanks usually have the edging in the darker color continue up the bra or is this new? These look so much like last years violacious I wondered if the pictures where recycled. I could have sworn there was a violacious/coal baseball sleeved Swiftly LS last spring. The color is really pretty and will pair nicely with Black Swan and Dense Purple but I think I’m taking a pass on with the exception of maybe a solid Tender Violet CRB if it exists.